Effects of the two-day-old strike of workers in the public sector were felt yesterday as teaching hospitals and medical centres turned back patients and discharged those on admission. In Asaba, Delta state, patients on admission at the Federal Medical Centre were forcefully sent home. It was a similar situation in Benin City where patients were discharged from the University of Benin Teaching Hospital. Also yesterday, stations of the Federal Government-owned Radio Nigeria were off the airwaves, just as the gates of post offices were shut nationwide. Employees of the Nigeria Postal Service were also protesting non-payment of their monetisation benefits. Gates to the General Post Office in Marina, Lagos and other post offices were under lock and key. The News Agency of Nigeria also had its services disrupted as a result of the strike. However, the federal government announced yesterday that by Monday, July 13, it would pay the sum of N40 billion into individual accounts of civil servants in the government parastatals whose allowances were not monetised when the policy commenced. Permanent Secretary, General Services Office (GSO) in the Office of the Secretary to the Government of the Federation, Dr Akeem Baba Ahmed, disclosed this at a workshop organised by the Association of Senior Civil Servants of Nigeria (ASCSN). He however said payment would be made in phases. However, the General Secretary of the Medical and Health Workers Union of Nigeria, Comrade Marcus Omokhuale said, what the government needs to settle the arrears of monetisation is N85 billion and not N40 billion. He said the unions had demanded that the federal government present a supplementary budget of N45 billion to make up for the shortfall. A call which was not heeded by the government. On the other hand, government through the Federal Ministry of Health, described the strike as “unfortunate', calling on the health workers to go back to work in the overriding interest of their patients and most importantly, as the office of the Secretary to Government of the Federation (SGF) is doing its best to address their grievances. The government in a statement by the Special Assistant to the Minister of Health on Communications, Mr. Niyi Ojuolape, said “lives are being lost right now and the hospitals are left with no choice than to discharge patients, even as new patients are not being attended to. The monetisation policy was introduced by the government of former President Olusegun Obasanjo. It was a policy of converting all the perquisites of office that federal employees enjoyed to cash. For instance, employees were no longer allowed to stay in official quarters at subsidised rates. The houses were sold to occupiers who could afford them. The affected unions commenced a strike Tuesday to protest non-payment of their monetisation benefits due to them between 2003 and 2005. 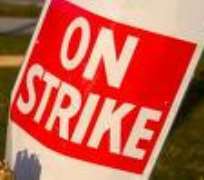 Unions involved in the strike include the Nigeria Union of Journalists (NUJ); Medical and Health Workers Union of Nigeria (MHWUN); Non- Academic Staff Union of Universities and Educational Institutions (NASU) and the Amalgamated Union of Public Service Union (AUPTRE). As early as 9am, patients who turned up at the various hospitals for treatment were turned back by the workers. Such hospitals include, National Orthopaedic Hospital, Igbobi; Lagos University Teaching Hospital (LUTH) and the Federal Neuro- Psychiatric Hospital, Yaba. It was a pathetic sight at the National Orthopaedic Hospital Igbobi, as most patients who were mostly Okada accident victims were turned back by the striking workers. A nurse who spoke to Vanguard on condition of anonymity at the hospital said the hospital discharged many of its patients from the wards yesterday. One of the affected patients told our correspondent that they had been asked to go home on Tuesday afternoon. He said initially, no one thought the strike would be so effective, until it became clear that the workers meant business when all services including catering, laundry, amongst others were withdrawn. The Lagos University Teaching Hospital (LUTH,) which is always a beehive of activities, was almost deserted as a few workers who were attending to patients in the early hours of the morning later withdrew their services in compliance with the strike called by Medical and Health Workers Union of Nigeria (MHUN). Although there were still skeletal services at the hospital, this was done by the doctors who are not a part of the strike. At Neuro-Psychiatric Hospital Yaba, only skeletal services were made available. Some doctors were seen attending to patients.